PT Elnusa Tbk - Elnusa is a one of the largest public-listed companies in Indonesia, running business in the field of upstream oil and gas services. 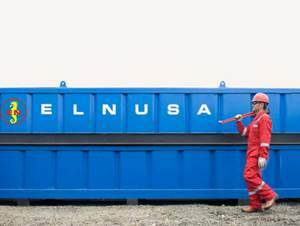 Elnusa has core business focus in seismic survey, drilling and oilfield maintenance. Elnusa also has supporting competencies in the field of energy distribution and logistic, marine support, fabrication and data management. Elnusa was created on 25 January 1969 and initially registered as PT Electronika Nusantara. The name PT Elnusa was launched on 9 September 1969. In February 2008, Elnusa conducted its initial public offering (IPO) on the Indonesia Stock Exchange (IDX) and its shares are traded on IDX under stock code ELSA. Currently, Elnusa is 41.10% owned by PT Pertamina (Persero), 17.81% by Pertamina Pension Fund and 41.08% by public. Elnusa is headquartered in Jakarta and now has 8 subsidiary/affiliated companies; PT Elnusa Geosains Indonesia, PT Elnusa Oilfield Services, PT Patra Nusa Data, PT Sigma Cipta Utama, PT Elnusa Fabrikasi Konstruksi, PT Elnusa Trans Samudera, PT Elnusa Petrofin, and PT Elnusa Patra Ritel. Candidate must possess education at least Diploma Degree in any field, preferably with Engineering background. Less than 1 year of experience in same position. Computer literate (able to use Microsoft Office, especially Microsoft Excel). Good in detail, high stress tolerance and maintain confidentiality. Willing to be placed at all over company work sites. Contract position(s) available (for 7 months). Candidate must possess education at least Diploma Degree in Mechanical Engineering, Electrical Engineering. At least 6 years of experience as Mechanic in oil and gas, mining or heavy equipment company. Mastering in handling heavy equipment machines, such as dump truck, dozer, excavator, etc. Have supporting certificates that related to the position. At least 2 years of experience as Mechanic or similar position. Able and understand in handling genset 150 KVA. Have supporting certificates that related to the position is a big advantages. Willing to be placed at Tambun Bekasi. Candidate must possess education at least Vocational/Technical High School or above (Diploma or Bachelor degree will be highly prioritized), majoring in Mechanical Engineering, Electrical Engineering. At least 5 years of experience as ESP Engineer, ESP Specialist or equivalent. Strong understanding about all aspects artificial lift, especially Electric Submersible Pump. Strong understanding about unistralling, installing and commissioning ESP equipment. JobsCDC.com now available on android device. Download now on Google Play here. Please be aware of recruitment fraud. The entire stage of this selection process is free of charge. PT Elnusa Tbk - SMK, D3, S1 Administration Staff, Mechanic, Engineer Elnusa August 2016 will never ask for fees or upfront payments for any purposes during the recruitment process such as transportation and accommodation.